It’s been over 4 years since Google hinted that the speed your site loads in web browsers will be an important factor of your online future. 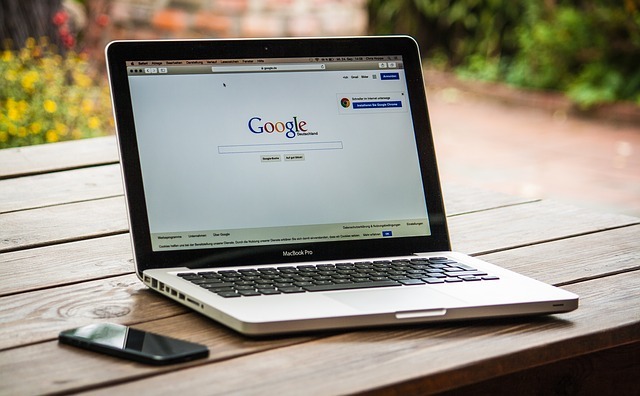 Back then, Google ran a test and discovered that by speeding up their search experience, they can get more searches done, and people will be prone to run even more searches if Google is fast enough to get them what they want. Transplant that experience to your site and it’s not a quantum leap to extrapolate that improving your site’s load speed will make your visitors happier and more prone to come back again and again. For online businesses that use one of the marketers-oriented WP themes such as OptimizePress, site speed is an extremely important factor. 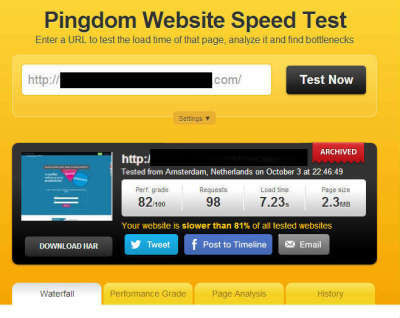 If you’re a website owner that is concerned about SEO, go to Pingdom and test how your site loads. If your site has more than 80 HTML requests, loads more than 3 seconds, you need to optimize your site for faster loading. Ideally, you’d want your site to be in the realm of 50 HTML requests and less than 2 seconds to load. A well-built theme goes a long way to get your site speed in that realm. But most of the themes are built for ease of using a nice look. So most will load way slower than this. I’ve seen sites load for 12 seconds and have 200 HTML requests. Here’s an actual site optimization project I worked on just recently. So these are real-life data from an existing site. Read on to understand what site speed does to your business, and how to use it to your advantage. HTML Requests: 98. This means that the site is constructed from 100 different elements: images, text blocks, CSS/JS files etc. The smaller this number is, the faster the site will load. Custom-coded websites usually have about 50 HTML requests, so for this website, it takes twice as much communication between the web server and a client’s web browser. On slow internet connections, this can mean a load time of eg. 8 seconds vs 4 seconds. This is one of, the reasons why custom-coded websites outrank WP-powered websites. But the good thing is that a properly built WordPress site can be just as fast. Shopzilla speeded up average page load time from 6 seconds to 1.2 seconds and increased revenue by 12% and page views by 25%. So basically, each second speedup can bring in on average 10% more traffic. Google introduced Load Speed as an important ranking factor where speed is considered a competitive advantage. But not too many people jumped on board, so recently Google’s ranking algorithm updates take into effect site speed, and dedicate negative points to slow sites. So website owners report up to 80% drop in traffic after these Google updates. By cutting down site load time from 6 seconds down to 2 seconds, Google can send you up to 40% more traffic. That means that with a single optimization procedure you significantly improve user interaction with your site and can double your online income overnight: no keyword research, no link building, no social activity. Only sleek on-site work that puts your site from the sidewalk onto the fast lane. Page size: 2.3MB. The larger a website is, the more time it takes to open up in a user’s browser window. On dedicated servers (these start at $99/mo) this may not be such a big deal, but on budget-friendly shared hosting accounts ($4-9/mo) it makes a big difference if your site is 1MB, or 2MB or even 10MB. Using large images can easily bloat up the overall size, and if you use more than one large image in your blog posts that can easily double or even triple the page size. Sloppily built WordPress themes with tons of junk code also have a significant impact on your site’s speed. So choose wisely. Looks may be deceiving, and you get to pay a big price for it. After the installation, configuration, and experiments, the reported site speed dropped significantly. On various speed tests, the site responded anywhere from 1,99 to 4 seconds, but most of the tests hovered around 2,3 seconds. The site size dropped to 1.3MB, and the HTML elements count dropped to 77. This site now loads 3 times faster than it used to. Without improving the content footprint, without building any backlinks, and without spending time doing Social Media Marketing, thanks to this improved load time, this site can expect a significant increase in visitors from Google. 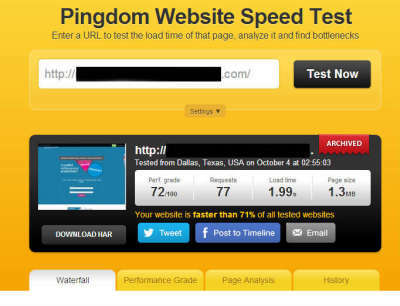 Interested in speeding up your site? Contact us.